It was a Thursday afternoon nearly eight years ago when Omar Reygadas heard the explosion that would seal him and 32 others inside a mine in the Atacama Desert in Chile. He wouldn't see the light of day again for 69 days. Reygadas, a 64-year-old widower, was the 17th miner lifted out of the 2,300-foot-deep refuge in a dramatic rescue effort that captured the attention of the world. Now, he is watching from Chile as international experts race to free a team of 12 boys and their assistant soccer coach from a flooded cave complex in northern Thailand. "It's terrible for them - they're little - but I believe that boys with a lot of strength are going to manage to be whole when they get out," Reygadas told The Associated Press. While he said that it is difficult for him to provide any advice, he encouraged the boys to focus on "reuniting with their families." "They shouldn't be ashamed to be scared," he added to the AP. "Because we were scared, too. Our tears also ran. Even as adult men, we cried." "My advice is to be firm. . . . I want them to know that being scared is normal. We were also scared, we also shed tears." Mario Sepulveda, another Chilean miner who developed the nickname "Super Mario" in 2010 as the dynamic spokesman on the videos sent up from below, also sent his support. "I have no doubt that if the government of this country puts in everything it can . . . this rescue will be successful," he said to Agence France-Presse in a video message. "We are praying for each of you." The team of Thai boys, ranging in age from 11 to 16, were exploring a six-mile-long cave 12 days ago with their assistant coach when the water level rose, trapping them in one of the chambers in the complex. In the two weeks since their disappearance, the effort to find, and now rescue, the group has drawn the attention of communities across the globe. More than 1,000 people from various countries are reportedly involved in the rescue efforts, and even more have volunteered to help. After saying on Twitter that he is " happy to help, Tesla chief executive Elon Musk on Friday confirmed that engineers from two of his companies, Space X and Boring, would be headed to the town of Mae Sai in northern Thailand to help the rescue team on the ground. Space X develops and manufactures spacecraft, while Boring is an infrastructure construction company that "has advanced ground penetrating radar & is pretty good at digging holes," Musk tweeted. The Thai government posted a image of Musk's tweet on Facebook, adding that the American engineers would arrive on Saturday to help with the rescue. "He may provide services for location tracking, water pumping or battery power," the government wrote. Earlier Friday, Musk said it be worth trying to "insert a 1m diameter nylon tube (or shorter set of tubes for most difficult sections) through cave network & inflate with air like a bouncy castle." Portuguese soccer player Cristiano Ronaldo told reporters at a FIFA event this week that "the world of football hopes that someone can find a way to take these kids out of there," CNN reported. Bear Grylls, the British adventurer and television host behind survival series "Man vs. Wild," has also weighed in. "So proud of you Jon Volanthen helping orchestrate this rescue - and no surprise you are a Scout volunteer Leader!" he tweeted, referring to one of the two British divers who first discovered the group. "We are here for you if you need any extra help," Grylls added. Others have expressed their support over social media, with many pitching ideas on how to extract the boys. Some suggest building a "small capsule" or "mini-submarine" while others, like Musk, have floated the idea of inserting an inflatable tube into the cave that will allow the group to crawl out. 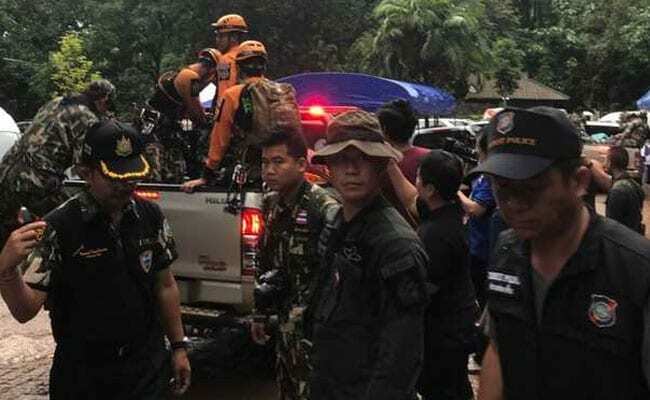 So far, however, the rescue team in Mae Sai has focused on searching for alternative entrances, pumping water out of the cave complex and teaching the boys how to dive. Experts say the currents in the cave are still too strong for novice divers to risk an escape, though the forecast of rain for this weekend has raised concerns that if a rescue is not done soon, the monsoon season in Thailand may leave the group trapped for months more. In his message to the group, Reygadas encouraged the boys to lean on one another for psychological support as a rescue plan is put in place. According to BBC Southeast Asia correspondent Jonathan Head, the head coach of the Wild Boars soccer team, Naparat Guntawong, described the 12 boys in the cave as top athletes who had bonded closely. "He was talking about what a tightknit team this is," Head said on the BBC World Service. "He's been training them for five years, and he said they're the top athletes in his group. . . . They've all been very strong-willed, and he's sure that their tight group mentality has probably helped them through this ordeal."